Shred crabmeat. Mix with all other ingredients. Form into 8 patties. Refrigerate for an hour. Spray a nonstick pan with cooking spray or an olive oil mister. Heat to medium high and carefully place crab cakes in pan. Let cook for 5 minutes undisturbed so crust forms. Turn carefully and cook for another 5 minutes. Serve with a swirl of avocado sauce. 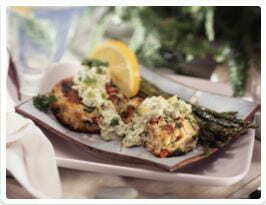 Each serving of 2 crab cakes contains about 148 calories, 26 g protein, 2 g fat, 102 mg cholesterol, 6 g carbohydrates, 1 g fiber, and 446 mg sodium. Each serving contains about 88 calories, 1 g protein, 8 g fat, 12 mg cholesterol, 4 g carbohydrates, 2 g fiber, and 15 mg sodium.